NEW YORK (AP) His voice quavering at an unexpected news conference, Sandy Alderson revealed what he had just told his team moments before. His cancer has returned, he’s taking a leave of absence – and his up-and-down tenure as New York Mets general manager is essentially over. With the team in a massive tailspin, chief operating officer Jeff Wilpon and the 70-year-old Alderson made the announcement before Tuesday night’s game against Pittsburgh. Assistant general manager John Ricco and special assistants J.P. Ricciardi and Omar Minaya will run the club’s baseball operations in Alderson’s absence. Minaya preceded Alderson as Mets general manager, and Ricciardi was GM of the Toronto Blue Jays from 2001-09. 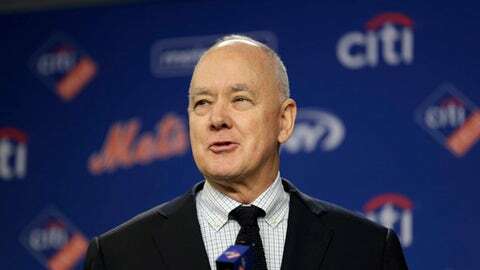 Alderson was hired by the Mets after the 2010 season. He was diagnosed with cancer at the end of the 2015 season and had surgery, but stayed on the job. He reduced his work schedule at times but remained in a full-time role while undergoing chemotherapy treatments. Alderson said a recurrence of his cancer was detected around late April or early May and he’s been receiving treatment since. ”I expect that the treatment will continue, expect to have surgery later this summer. My prognosis is actually good. But in the meantime, the chemotherapy, the surgery, all take their toll,” Alderson said. He said the treatment affects his energy level and leads to other side effects, explaining why he hasn’t been traveling on road trips lately. ”Which makes it difficult to stay up with sort of the pace, the tempo of the every day,” Alderson said. ”Operations continue, the game continues, we have a season to play. So I think in the best interests of the Mets and for my health, this is the right result. Alderson’s departure comes at a pivotal time for the Mets ahead of the July 31 trade deadline. Needing an infusion of young talent, they will likely look to sell off pending free agents such as closer Jeurys Familia, second baseman Asdrubal Cabrera and outfielder Jose Bautista. But ace pitchers Jacob deGrom and Noah Syndergaard could command a huge return, and the front office must decide whether to embark on such a significant overhaul. After going 70-92 last year, the Mets replaced manager Terry Collins with Callaway and spent nearly $90 million to fill holes in free agency. They jumped out to an 11-1 start this season, but a 6-24 slide left them 31-45 with the fewest wins in the National League going into Tuesday night’s game. ”We’re going to be there for Sandy as much as Sandy’s been there for us. A lot of times he has taken the heat on our behalf,” Wright said. Alderson, a Marine Infantry Officer who served in Vietnam, is a Harvard Law School graduate. Before joining the Mets, he worked in the commissioner’s office and had success running the Oakland Athletics and San Diego Padres.